diabierna afternoon, one person victima of ladronisia for of one choler, he therefore.l.r. naci at aruba of 47 year, is bay keep of police at beach y is haci denuncia contra the choler g.d. cu owing to steal his cartera of his car. the is tell police cu the was sit in ranchostraat in his car, y the choler g.d. owing to come serca dje y the enter his car without his permit y owing to ofrece p’e cumpra one dvd. therefore.l.r. owing to deny the choler of cumpra the dvd y owing to bise cu the do not interesa. hour cu the choler g.d. owing to descend for of the car, past owing to descend also cu cartera of therefore.l.r. therefore.l. r. owing to bay ne shelter roof on cabez, y eynan the personal of the lugar dune his cartera. police did take his complaint. presencia of police owing to wordo ask saturday 3.07 of madruga at hard rock café, for one caso of ladronisia, where one police fuera of servicio owing to detene one muher colombiano cu cosnan steal. n’e sitio, police is come across the police fuera of servicio cu the muher therefore.g. naci at colombia of 30 year, that owing to steal 3 bag for of various person y owing to saca they contenido. come across. police is achieve informacion cu they owing to see therefore.g. leave for of bathroom cu celular y articulonan cosmetico in his hand. the personanan cu owing to lose they bag owing to bay haci investigacion y owing to achieve all 3 bag throw in sweep of dirt in the toilet. police did take therefore.g. for of the police y owing to hibe keep of police at north. one mother young cu two baby, saturday 7.15 of night, is ask asistencia of police at one cas at bakval. 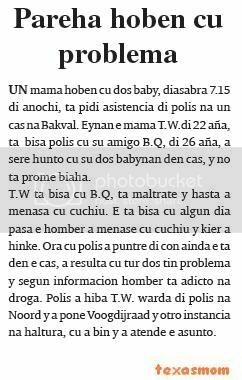 eynan the mother t.w.di 22 year, is tell police cu his amigo b.q, of 26 year, owing to sere together cu his two babynan in cas, y do not first trip. t.w is tell cu b.q, is maltrate y even owing to menasa cu cuchiu. the is tell cu some day happen he owing to menase cu cuchiu y wanted owing to hinke. hour cu police owing to puntre of con still the is in the cas, owing to resulta cu all two have problem y according informacion man is adicto at drugs. police owing to take away t.w. keep of police at north y owing to place voogdijraad y another instancia at height, cu owing to come y owing to atende the asunto. yesterday evening for near of 7’or central of police is wordo notifica for one accidente fast of ipa the trip here one madam is bolter his car. this will have to was biniendo of upstairs of cual of one as or another owing to lose control of his car y bolter bay cay in one cura of cas near pazuid of the scol. the lady owing to wordo deteni door of posiblemente is below ; influencia of alcohol. monday morning police of san nicolas is descubri one safe throw near of caminda pazuid of cemetery catolico at san nicolas. this is wordo take away keep of police for follow cu investigacion. all cos is indica cu here is deal of one of the tanto safenan cu owing to being steal ultimamente, break y ladronnan owing to bay cu all pertenencia. but for of where y cua business or cas, esey is being investiga. diadomingo nightfall, during the parade of the faction of mep, much problem owing to surgi, y police had they hands complete. so police have to owing to bay diadomingo 5.30 of nightfall at height of joe laveist sport park, where one man owing to wordo maltrata cu one boter, according the melding cu owing to enter at central of police. at arrival, testigonan is tell police cu the victima c.r. naci at aruba of 66 year owing to wordo maltrata cu one piece tree, by of simpatisantenan of the faction berde. the witness cu owing to notifica police of locual cu owing to happen owing to tell cu the self owing to dune first help y ambulance owing to hibe centro medico for tratamento. hour cu police was bayendo centro medico they're see one are of simpatisante of faction mep, stop fast one cas y is discuti cu the habitantenan. police owing to constata cu the are of mep was furious y apunto of ataca the habitantenan. police owing to stop y owing to bay atende the problem y they're constata cu is deal of the same are cu owing to informa police cu he sospechoso is in the cas scondi. police owing to bay n’e cas y owing to talk cu he r.t., naci at aruba of 60 year y the is tell cu he c.r. owing to try happen car on they y after hour cu past owing to descend for of his car cu one tree in his hand, past owing to trompeca y owing to cay. r.t. is tell police cu they owing to try of yude, but past owing to cuminsa sway cu the tree y owing to strike one family of dje. while cu police is talk cu r.t., the are of mep was haci enough fastioso y police have to core cu they various trip for of the sitio. mirando cu they not was follow ordo of police, they have to owing to ask refuerso for core cu they for of eybou. 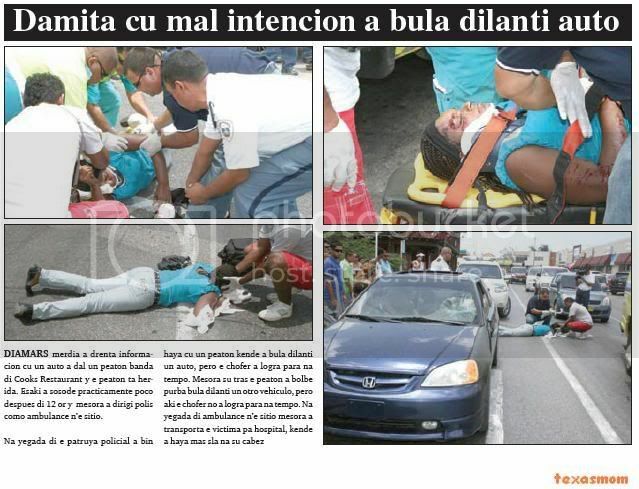 police owing to bay after centro medico for place they self at height of the injury cu c.r. owing to ricibi. eynan they owing to talk cu the doctor cu owing to atende c.r. y the is tell cu the chop at his cabes probably owing to wordo ocasiona for one stone. recherche is investigando the caso. madam owing to.q.s. naci at colombia of 37 year owing to ask asistencia of police at one cas at cashero for his casa the.c.y naci also at colombia of 36 year, that owing to arrive cas 5’or of madruga sober y owing to follow drink y also is zundra y haci fastioso. the muher is tell police cu he owing to arrive cas 5’or of madruga, y enbes of bay sleep, for of the hour ey the was zundra y drink. near of 11’or of afternoon, owing to.q.s. owing to tell police cu past owing to calling one primo for hibe cumpra cuminda. after cu past owing to cumpra the cuminda, past owing to sit come in car of his primo. dado instant he owing to come afo cu they baby in his hand. hour cu he owing to mire in the pickup, past owing to cuminsa ranca door of the car y owing to break the glass. 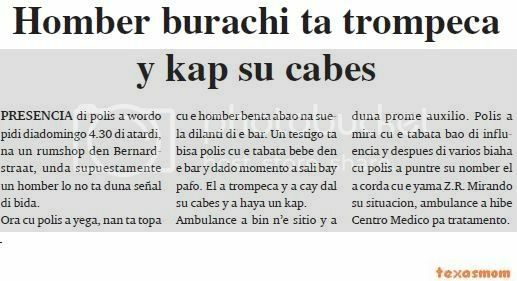 the madam is tell police cu the splinter of the glass owing to cay on the baby. the muher owing to descend for of the car y owing to ask he for dune the child, but past owing to deny. hour cu police owing to arrive n’e cas, he not was n’e sitio more. the muher owing to tell police cu his day after the is bay recherche give complaint. presencia of police owing to wordo ask diadomingo 4.30 of nightfall, at one rumshop in bernardstraat, where supuestamente one man will do not give sign of life. hour cu police owing to arrive, they're come across cu he throw abao at floor fast of the bar. one witness is tell police cu the was drink in the bar y dado instant owing to leave bay pafo. past owing to trompeca y owing to cay strike his cabes y owing to achieve one chop. ambulance owing to come n’e sitio y owing to give first help. police owing to see cu the was bao of influencia y after of several trip cu police owing to puntre his name past owing to corda cu the calling z.r. mirando his situation, ambulance owing to hibe centro medico for tratamento. one person cu owing to stay victima of ladronisia y owing to lose his laptop, diadomingo 11 or is ask presencia of police at one cas at flamingostraat, where owing to grab the conocido of police l.r. 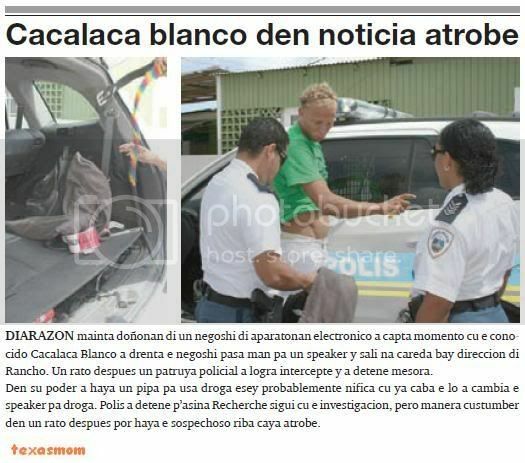 naci at aruba of 28 year, that owing to steal in his cas. at arrival police is talk cu he the. 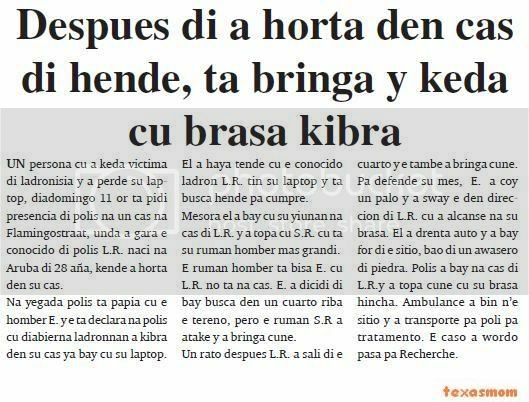 y the is declara at police cu diabierna ladronnan owing to break in his cas already bay cu his laptop. past owing to achieve hear cu the conocido thief l.r. have his laptop y is busca person for cumpre. at once past owing to bay cu his yiunan at home of l.r. y owing to come across cu s.r. cu is his brother man more big. the brother man is tell the. cu l.r. do not at home. the. owing to dicidi of bay busca in one cuarto on the territory, but the brother s.r owing to atake y owing to fight cune. one rato after l.r. owing to leave of the cuarto y the also owing to fight cune. for defende his self, the. owing to coy one tree y owing to sway the in direccion of l.r. cu owing to alcanse at his arm. past owing to enter car y owing to bay for of the sitio, bao of one awasero of stone. police owing to bay at home of l.r.y owing to come across cune cu his arm swell. ambulance owing to come n’e sitio y owing to transporte for poli for tratamento. the caso owing to wordo happen for recherche. tuesday afternoon atracadornan owing to throw one atraco arm on ying je supermarket at solito. after of owing to enter the lugar cu they cara tapa owing to place arm at cabes of the propietarionan, saying atraco atraco y demandando for coin. tuesday afternoon owing to enter informacion cu one car owing to strike one peaton near of cooks restaurant y the peaton is injury. this owing to sosode practicamente some after of 12 or y at once owing to dirigi police because; ambulance n’e sitio. at arrival of the patrol policial owing to come achieve cu one peaton that owing to fly fast one car, but the chofer owing to succeed stop at time. at once his slow the peaton owing to go back try fly fast one another vehiculo, but here the chofer not owing to succeed stop at time. at arrival of ambulance n’e sitio at once owing to transporta the victima for hospital, that owing to achieve more sla at his cabez. monday 8’or of night, police of beach is bay at one lowrise hotel, where one tourist owing to fly for of balcon of his bedroom. n’e sitio, police is achieve informacion for of one another tourist cu he d.c. was bao of influencia y angry y owing to fly for of the balcon. according his declaracion, d.c. was in bedroom is drink cu some another tourist y they owing to cuminsa play bruto. in esey, d.c. owing to angry y owing to fly for of the balcon. ambulance cu owing to come n’e sitio owing to hib’e poli for tratamento. monday morning 10.30, police of north is bay behind kapel of alto vista, where one trahador of one carrental owing to succeed grab one young cu was coriendo in one v-wagen steal. n’e sitio, police is talk cu the trahador, that is tell cu past owing to come across the car v-5226 color of gold on caminda y owing to follow his slow, by cu the was know cu the car was steal. past owing to core behind the chofer till behind kapel at alto vista, where the chofer l.d.w. naci at aruba of 17 year owing to break wiel of the car y also owing to chop the tire. hour cu police owing to arrive still the young l.d.w. naci at aruba of 17 year, was n’e sitio. police owing to detene y entregue at departamento of j.k.z.p. cu is follow cu the investigacion. 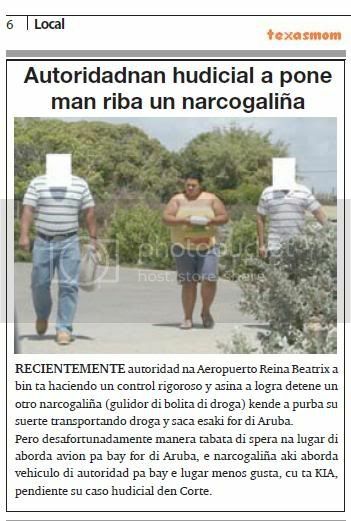 recientemente autoridad at aeropuerto queen beatrix owing to come is haciendo one control rigoroso y so owing to succeed detene one another narcogaliña (gulidor of bolita of droga) that owing to try his suerte transportando drugs y saca this for of aruba. but unfortunately as was of wait for instead of aborda plane for bay for of aruba, the narcogaliña here aborda vehiculo of autoridad for bay the lugar less like, cu is kia, pendiente his caso hudicial in corte. diarazon afternoon one choler naci at colombia. but cu pasporte dutch cu have the bad costumber of shoplift, owing to being captura is steal again. here at one supermercado in oranjestad the choler here cu is march good dress y all hour have suerte cu casi the do not achieve castigo y is follow cu his racha of shoplifting. the trip here past owing to being see y graba on video hour past owing to coy the boter of whisky hinke in his carson. at once one employee owing to bise for saca the boter locual cu the thief does not owing to haci, but will contrario. past owing to saca the boter y bay agredi the employee cual after owing to start one luchamento where owing to break one door of glass. after the thief owing to leave core bay y we owing to succeed saca his photograph. hour we owing to ask about the doñonan of the supermercado, if they will entrega complaint, they owing to tell of do not interesa in entrega complaint already cu nothing will change. ultimamente more y more the kehonan is enter cu cholernan is molestiando clientenan at one pompstacion. diarazon madruga again police owing to being ask for come aleha the choler cu was molestia all cliente. at arrival of the patrol policiail, owing to come encontra cu the conocido choler cathlyn that again owing to being cori for of the sitio. this owing to stop become one another weight more on cuerpo policial cu instead of work on preveni criminalidad, is as hands ocupa for core cholernan for of sitionan publico. diarazon morning doñonan of one business of aparatonan electronico owing to capta instant cu the conocido cacalaca blanco owing to enter the business happen hand for one speaker y leave at careda bay direccion of rancho. one rato after one patrol policial owing to succeed intercepte y owing to detene at once. in his power owing to achieve one pipe for using drugs esey probably nifica cu already end the will owing to change the speaker for drugs. police owing to detene p’asina recherche follow cu the investigacion, but as custumber in one rato after can achieve the sospechoso on caya again. presencia of police is wordo ask tuesday 2.15 of afternoon at one cas at shiribana, where one son owing to maltrata his mother of edad. n’e cas police is talk cu the mother, that is tell cu his son r de m. owing to dal’e. police owing to notice cu hand of the mother was bleed y the had one chop serious. 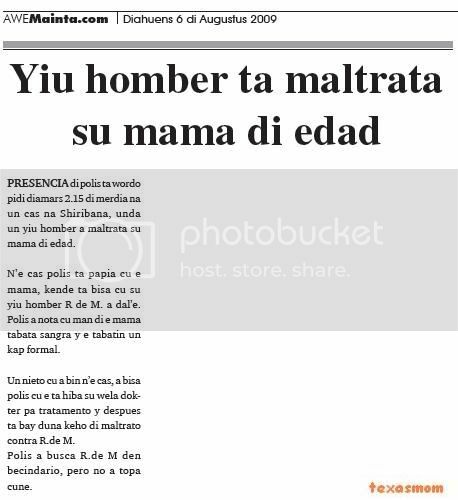 one grandson cu owing to come n’e cas, owing to tell police cu the is take away his grandmother doctor for tratamento y after is bay give complaint of maltrato contra r.de m.
police owing to busca r.de m in becindario, but not owing to come across cune. tuesday 3.15 of madruga, police is achieve informacion cu have one man is core behind one choler near of one restaurant in lagoenweg. motibo is cu the choler owing to try atraca one madam. police is bay y is come across cu one conoci of they, that owing to tell police cu past owing to core behind one choler cu wanted owing to atraca one madam y the choler owing to bay direccion panort. police owing to busca in the direccion, but not owing to come across cu the choler. presencia of police owing to wordo ask diarazon morning for 7.30 at one cas at hooiberg, for caso of hincamento. n’e sitio, police is achieve informacion cu the muher owing to.m., naci at aruba of 39 year owing to come at home of the muher g.m.b. naci at aruba of 31 year, y owing to hinke at his duim cu one cuchiu of clip bread. police owing to see cu g.m.b. had one injury at his hand. he the.r., naci at aruba of 46 year, also was n’e sitio, that owing to maltrata owing to.m. cu one obheto after of one discusion. police owing to detene owing to.m. y the.r. for maltrato cu arm. owing to.m. 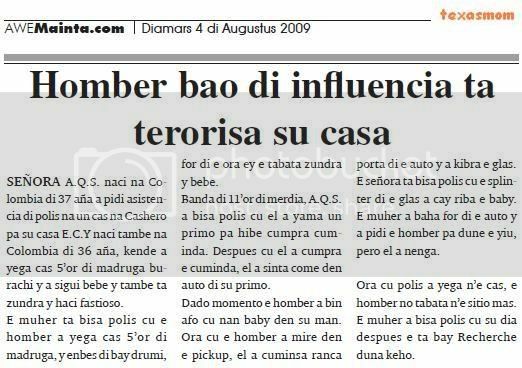 cu was bao of influencia of alcohol, owing to wordo close first for drunkenness y after is investiga the caso of maltrato. Page created in 6.157 seconds with 19 queries.